What a lovely, ingenious idea! We ALL look for CLOSE-UP material that is suitable for kids and still amazing to adults, and who better than Canada’s Bill Abbott (a very dynamic and creative magician) than to offer a whole collection on the topic. Bill performs this highly original collection in front of real people, and it’s beautiful to watch. The magic is NEVER juvenile and rarely silly; it’s cool stuff you would be proud to show to only adults, but is also ACCESIBLE to children. A standout for us is “Edwin Alonzo Boyd,” a great twist on a classic trick you may already know. This is a wonderful value and a DVD unlike any you have seen. Oh…and it’s FOUR HOURS of stuff! Great value. More Information: This Deluxe Edition DVD Set includes the re-edited and re-mastered original performances and explanations from the landmark DVDs Bill Abbott Performs Close-Up For Kids and Bill Abbott Performs Stand-Up For Kids plus over 75 minutes of Deluxe Edition Bonus Features! Sponge Balls – A classic that Bill uses as a perfect opener for kids. The Shadow – An extremely visual card change that happens 3 times in the participants own hands. The Autograph – A motivated card-in-wallet routine that leaves a child with a true collector’s item they will treasure forever. The Ninja Card Trick – Bill’s favorite card effect that features finding a selected card at the point of a miniature ninja sword. The Mental Photograph – A very strong promotional tool, where a mental thought of playing card appears on your business card being held by the spectator. Edwin Alonzo Boyd – A riveting tale about a real-life jail break demonstrated with a photograph of the criminal that becomes permanently altered at the conclusion. The Great Game – A routine with many applications limited only by your imagination. A freely selected prize is predicted in advance by the performer, and is given to the child to keep at the end. Flash – Bill’s closing effect that features an original presentation for the ashes on palm. This effect has built a reputation for Bill with lay audiences. Card on Forehead – A classic effect redesigned for young children with a great finish! The Sponge Snack – When touring across Canada Bill performed this silent opener 110 times in 90 days! Develop an instant rapport with audiences with this humorous routine that non-verbally communicates that your show will be fun, magical and full of surprises. The Thing – Practical, one-man levitation’s are few and far between. Bill has created a reputation-making miracle that can be performed anywhere. From the smallest living room to the largest theater stage to the most stringent street conditions. The thing can float in any performing situation with your audience viewing from any angle. 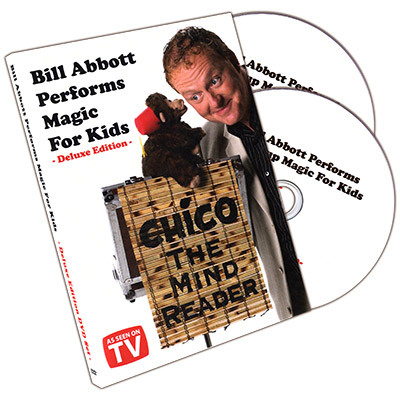 Chico The Mind Reader – For those who have witnessed a performance of Chico know that the revelation of this routine is worth the price of the DVD set. Bill has booked more shows from this one routine than any other in his repertoire. The explanation segment is a virtual course in the creation, development and performance of you won original puppet routine. The Three Bears – The Equal-Unequal Ropes performed live at a family resort with some original twists and then explained in detail. Cut & Restored Rope – See how this classic of stand-up magic entertains a nightclub crowd then join Bill at an exclusive lecture at Denny & Lee’s Magic Studio in Baltimore for the detailed explanation. Cut & Restored on T.V. – Witness the hosts of a preteen talk show be entertained and completely fooled by Bill in broadcast quality. Nightclub Monkey Business – Experience why Chico is flexible, entertaining and truly for all ages. Chico takes this nightclub audience of adults by storm. Chico’s Secrets – The real secrets of creating a memorable puppet routine revealed. Chico on T.V. – Chico brings the star of this popular kids show to tears…of laughter! Street Thing – Bill demonstrates how practical, effective and powerful The Thing is on the streets of downtown Toronto. Signed Bill in Orange – The classic effect performed live on T.V. Flash on T.V – See the host of Canadian Idol flee the studio in fear and disbelief! Sponge Balls – Witness this audience favorite get squeals of delight from the studio audience. The Shadow & The Autograph – Great reactions on live T.V. for this solid piece of slight of hand. The Ninja Card Trick – The ninja returns looking better and faster than ever. Mental Photograph – This gets a tremendous reaction for such a simple effect. The Boyd Mystery – Historical Toronto story performed live. Flash on Studio Magic – See why dead pets still make the best assistants!